Thank you for using Little Reader! Whether you have purchased Little Reader or you are just trying it out, please spend a brief moment to run through this Beginner's Tutorial so that you and your child may get the most out of Little Reader. If you've never seen a baby reading before, you can see dozens of reading babies on the Baby Reading Videos page at brillbaby.com, including my own daughter Felicity reading at 12 months. You can also see many babies reading using Little Reader at our Little Reader Video Testimonials page. We also recommend that you familiarize yourself with knowledge on teaching babies to read by going through our Teaching Your Baby To Read booklet, which you may find in your purchased boxset or download here. This booklet will answer questions such as, "Why teach reading early? ", "How do you teach babies to read? ", and "What about phonics?". If you're ready to begin using the software, just click on the NEXT button below to continue with this Beginner's Tutorial! You have already successfully installed the Little Reader software. 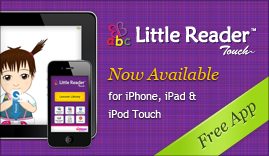 As soon as you install Little Reader, you can start taking Little Reader for a test drive. The software comes with starter content which includes the first 9 days of the English curriculum, and you can use Little Reader's PRO features (full suite of lesson editing options) for a 14-day trial period. If you purchased online, an account will have been created for you already. If you don't have an account yet, you can create a BrillKids Account here. Note: If your box set came with a DVD-Rom labeled "Software + Content" you would have installed your Little Reader software with your full curriculum pre-loaded already. For support regarding setting up your Little Reader, please see our Help Desk. The Little Reader curriculum is a 1-year curriculum (made of two 6-month Semesters) which gradually leads your child from learning single words, to couplets, phrases, sentences, and finally, full stories. Curricula in other languages such as Spanish, French, Thai, Russian and Chinese are also available for separate purchase as an add-on for your Little Reader lesson library. 1. Click on the PLAY COURSES button in Little Reader. 2. Select the semester you want to play from the list of Available Courses. 3. Choose the lesson day you want to play, starting from Day 001 Lessons. 4. Press the big PLAY button. Note: The lesson types listed above applies to the English curriculum. Other language curricula may vary. For more about the different types of lessons, see the next section (4. More About Each Lesson Type). The curriculum is designed to be played 5 days a week, once or twice a day. Each session only needs to be played once. You may find it convenient to play Session 1 in the morning, and Session 2 in the evening. Many working parents like playing Session 1 before leaving for work, and Session 2 after returning from work, from Monday to Friday, and either taking a break during the weekends, or using that time to catch up on any missed days. If you only have time to play one session a day, choose either Session 1 or Session 2, alternating between the two if you can. Here are some tips on making your child comfortable, and maximizing learning - and fun! Seat your child on your lap or next to you. Make sure the screen is at least 24 inches (60 centimeters) away and at your child's eye level. Make sure that the learning area has sufficient lighting. Give the lesson when your child is in a receptive mood. Never attempt a lesson when your child is tired, sick, or disinterested. Be lively and have fun during lessons! During lessons that require manual forwarding of slides, such as Multisensory lessons, repeat the words back to your child. Go back to the previous slide or repeat the slide if necessary (clicking the right mouse button and mouse-wheel, respectively). Take your time to talk to your child about what is shown where possible. For example, when seeing a picture of a dog, you could comment, "Doesn't that look a bit like Uncle Ben's dog? ", or "wow, I wonder what kind of dog that is?" During Game lessons, encourage your child to point to the correct word or picture. After she has chosen, click on it, even if it is the wrong one. Always congratulate her for trying. If your child doesn't want to try, you can point to the wrong one and say, "I think it's this one! Let's see...", which may already spark a reaction. If not, click on it and say, "Oops! Let's try another one!" This way, you are showing your child that what's most important is not the result, but the trying. These lessons simulate the flashing of pictures to your child and is useful for consolidating her understanding of the meaning of the words. Shown in 'flash' style, the slides are auto-forwarded. The pictures of all the words shown in the multisensory lesson are flashed here. This method works by involving as many of your child's senses as possible. The most important thing to remember here is to interact with your child as much as possible. Let your child not only see the word and hear the word, but also feel the word whenever appropriate. For example, help her clap her hands for the word 'clap', rub her ear for the word 'ear', and let her point to yellow objects for the word 'yellow'. If you can engage the sense of smell and taste too, then even better! The lessons are set to be manually forwarded (either by clicking on the mouse or pressing the spacebar), so take as much time as you need. Where appropriate, run your finger under the words as the words are read, to indicate the direction of reading. Pattern Phonics™ lessons are used to give your child an intuitive understanding of the sounds of letters and how words can be broken up into different parts. This is done by showing a series of words grouped together in a coherent way for example, words beginning with 'b') and color-coding the words to make the patterns obvious. Lessons are delivered like word flash lessons – fast and auto-forwarded. These lessons use the flash method, which involves rapid flashing of words to your child. This method takes advantage of your child's right-brain ability to absorb large quantities of information rapidly. These lessons simulate physical flash cards being flashed rapidly to your child. The lessons here are set to be auto-forwarded so you only need to let your child watch them. Sight Words lessons show words from the Dolch word list which mainly comprises words that were commonly found in children's books, many of which are difficult to be sounded out using phonics rules. In Word Split lessons, we introduce the concept that words can be split into different parts, and demonstrate how those parts are sounded out. Some lessons split words into syllables, and some into phonemes. These lessons, along with the Pattern Phonics lessons, will slowly help your child to gain phonemic awareness. From semester 2 onwards, your child will be shown complete stories. Prior to this in semester 1, your child will have already been shown many words which make up the stories. These lessons require you to advance the slides manually, so like the multisensory lessons, take your time to engage your child in the story and interact with her. These lessons will present multiple words or pictures on the screen, and ask your child to identify the correct one (eg., "which one is 'dog'?"). In Auto mode, the number of choices for a particular word will increase each time a correct guess is made, and vice versa. Click on whichever choice your child makes, even if it is not the correct one. Most importantly, remember to treat this as a fun game and not turn it into a test! One of the best ways to engage your child's attention is by customizing the content that you show her. Use the in-built Easy Voice Recorder software to record your own voice. You could even go further and edit the Curriculum Content. For example, instead of using the five pictures we give you for 'nose', you could delete those and pictures of Mommy's nose, Daddy's nose, and your child's own nose! Doing this is optional but highly recommended as it would make your child's lessons much more meaningful. Once you get the hang of creating content, you can even create entirely new Categories, such as local fruits, or other topics of particular interest to your child. Click here for information on how to create and edit words. Apart from creating new content, you could also download literally thousands more content files from our Little Reader Library! Simply proceed to the Little Reader Library and browse around for categories or playlists that may interest your child, whether in English or in other languages. You can preview the content before downloading, or click on "DOWNLOAD" to have the content automatically downloaded to your computer, ready to be imported into Little Reader! Downloaded content can be accessed in the Play & Edit screen, under "Categories" or "Playlists." After downloading or creating more content, you could even insert them into your curriculum, either in place of Categories which she is already familiar with, or in addition to what's already there. Do not force your child if she is not keen to view the lessons. Focusing on results tends to bring about negative emotions such as anxiety and disappointment, which will be picked up by your child. Similarly, forcing your child is counter-productive and would lead her to associate reading with something negative. Remember, this is not a race! Any exposure to reading that you give to your child during the early years will already be very beneficial. So just RELAX, and HAVE FUN! So if are tired and you want to skip a day, no problem! If your child doesn't seem to want to have lessons that day or even that week, that's absolutely fine! If you feel that your child already knows the words, then skip them or remove that category from your curriculum! Wondering how to use the teaching materials from Little Reader Deluxe? Watch these short video clips to learn more about how to use the Pattern Phonics Flip Cards and the Storybooks! "..the best thing about Little Reader is that it builds positive parent-child social interactions and expands opportunity for the parent and the child to talk and have fun with books, concepts, and words. Everything the parent needs is right there in the kit - just pick it up and interact." We're so convinced Little Reader is so effective, that we guarantee your child will learn the basics of reading after completing the 12-month curriculum, or we'll give you your money back!